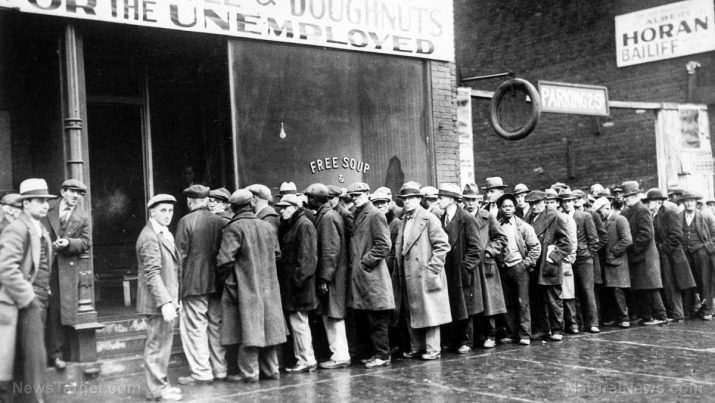 The Great Depression was a severe worldwide economic downturn that began in 1929 and continued until about 1939. It affected North America, Europe, and other industrialized areas of the world. It was the most serious economic tragedy ever experienced by the industrialized Western world in modern history. The full burden of the economic crisis fell squarely on the shoulders of the nation’s working class. They struggled badly for their survival during this most difficult period, which led them to find a number of ways to put food on the table. The following Great Depression foods helped them live from day to day when nothing else was available. Mock apple pie – As the name suggests, this recipe is but a mock version, which means it contains no actual apples. This recipe replaced apples with crushed crackers, cinnamon, and a flavored syrup. The most famous version is the Ritz Mock Apple Pie, which contained sugar, butter, cinnamon, lemon juice, and Ritz crackers. Prune pudding – This infamous dessert gained popularity when former First Lady Eleanor Roosevelt convinced the President to serve it to the White House’s guests. Roosevelt’s White House ate modestly in “an act of culinary solidarity with the people who were suffering,” according to Jane Ziegelman, the co-author of A Square Meal, in an interview with The New York Times. Mulligan stew – This is among the many stews that homeless people made during this time. The recipe had many versions as a result of tossing in the pot anything that the maker could find. Some people used scavenged or stolen onions, potatoes, corn, and all sorts of mixed vegetables. Did you know that this stew even occasionally contained a bit of lint and Bull Durham tobacco to flavor the broth? Dandelion salad – The dandelion was considered a pesky weed by gardeners, but this plant was a favorite during the Great Depression era. People would add dandelions with other greens found from any neighborhood, seasoning it with pepper, salt and vinegar if available. Peanut butter stuffed onions – This recipe combined onions and peanut butter; onions were baked and scoops of peanut butter were filled inside them, one of the most bizarre meals to have been made during the Great Depression. Vinegar cobbler – This dessert replaced fruits with vinegar, and added sugar, water, butter, nutmeg, flour, and vanilla on the baking pan. Apple cider vinegar was used to substitute real apples. Spaghetti with boiled carrots and white sauce – This is another one of the dishes that Eleanor Roosevelt introduced during the Great Depression. It was spaghetti cooked until mushy and mixed with boiled carrots. The white sauce was made from milk, flour, salt, butter or margarine, and a little bit of pepper. After mixing, pour into a tray and bake to make a casserole. Potato pancakes – Potatoes are widely available and are among the most affordable food items. During the Great Depression, people used potatoes to replace different ingredients. One of the commonly cooked dishes was a potato pancake, wherein grated potatoes were fried or cooked in a pan. Meatless loaves – Real meatloaves were scarce during the Depression era, which gave way to meatless loaves made using any item that was available, such as raisins and peanuts. Milkorno – It is a blend of cornmeal, powdered skim milk, and salt. Upon boiling, all ingredients of Milkorno become a part of a porridge. Today, these foods are considered some of the most abhorrent concoctions ever made. But back in the days of the great famine, these bizarre food combinations helped put food in people’s stomachs as they struggled to survive the Great Depression. Read more articles on how our grandparents survived during times of austerity at SHTF.news.